U.S. Army combat engineer Francois Clerfe made it to his home in Monterrey, California, just in time to witness the birth of his daughter – and he took 10 flights to get there, as he is stationed in Iraq. “From Kuwait to Turkey, to Turkey to Frankfurt, Frankfurt to Baltimore, Baltimore to Atlanta,” Clerfe told WCVB, describing his journey back home. 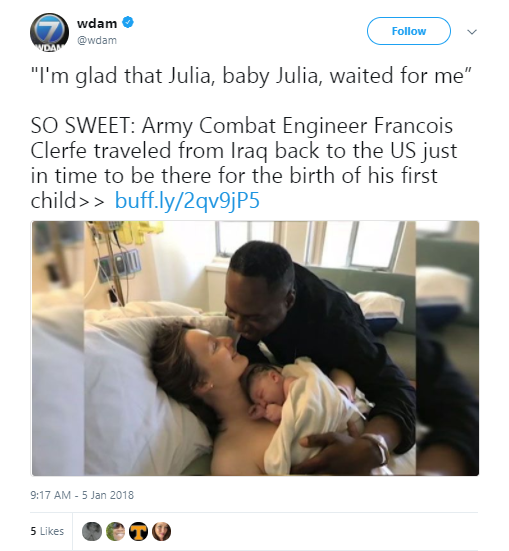 After traveling thousands of miles to make it home, Clerfe made it back in time for the birth of his first child, Julia, on New Year’s Day. She was the first baby born in 2018 at the Community Hospital of the Monterey Peninsula. Clerfe was able to come home as a result of a special policy to help support his wife, Natalia Svistunova. “It was fun and exciting at the same time,” Clerfe said, about worrying that he wouldn’t make it home in time. “I’m glad that baby Julia waited for me,” he added. “You know, I had the feeling that he would make it because he really wanted to be here, next to us,” Svistunova said. Because his daughter was born more than a week early, Clerfe will get more time to spend with his family before he has to head back to Iraq next month.